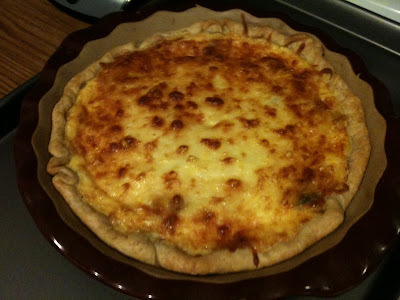 I was in the mood to try some new quiche recipes. Id only ever made my mom's recipe and wanted something different. I found this Emeril recipe and fiddled with it a bit. Its definitely NOT on the light side but it is so rich and decadent! Its perfect for a brunch when you want to impress. 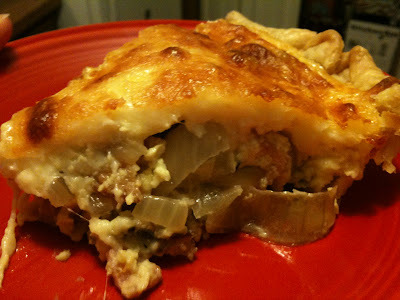 My husband proclaimed this to be his new favorite thing and that real men would eat quiche if it all tasted like this. BAM! 6. Remove onion/mushroom mixture with a slotted spoon (to drain excess grease) Allow mixture to cool.